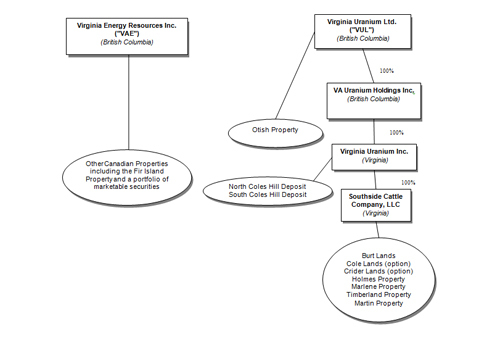 Virginia Energy Resources Inc. (TSX.V: VAE) (OTCQX: VAERF) is pleased to announce that it has signed a letter agreement dated June 6, 2012 (the "Letter Agreement") with VA Uranium Holdings, Inc. ("VAUH") and Virginia Uranium Ltd. ("VUL") with respect to the proposed spin out of certain assets of VAE to its wholly-owned subsidiary, VUL and a consolidation of the ownership of VAUH into VUL. VAE currently holds a 29.41% interest in VAUH, a private company that owns the advanced stage Coles Hill uranium project in Virginia. The transaction will divide VAE's portfolio of exploration and development properties between two separate companies whereby one company will focus on exploration while the other focuses on development. In addition, the consolidation of the ownership of VAUH through VUL will simplify the ownership structure of the Coles Hill uranium project in a single publicly traded entity. Walter Coles Jr., the President & CEO of VAE, commented, "The objective of the transaction is to enhance value for all shareholders of VAE and VAUH. The Board of Directors for both companies are confident that, by reducing the complications of the current share and holding structure, this transaction will facilitate the ability of the market to more fully recognize the underlying values and differentiate risk profiles of the early stage exploration targets and the more advanced development stage Coles Hill project. The objective is for the VAE shareholders to own 100% of the exploration assets plus 29.4% of the Coles Hill project but in a more understandable structure through two separate publicly traded entities. We believe the value of the Coles Hill project will be further appreciated as a single public entity to be created in VUL which will own 100% of that project." VAUH's shareholders will receive shares of VUL in exchange for their current shareholdings in VAUH. VAE shareholders owning, in the aggregate, approximately 29.4% of the outstanding shares of VUL. The transaction will be structured by way of a plan of arrangement under the provisions of the Business Corporations Act (British Columbia) to be formalized in a definitive arrangement agreement to be entered into among the parties. As part of the transaction, the names of VAE and VUL may be changed. The transaction is subject to certain conditions, including the approval by the shareholders of VAE and VAUH, approval from the Supreme Court of British Columbia, approval of the TSX Venture Exchange and the listing of the shares of VUL. Additional details of the transaction will be described in detail in the joint information circular to be mailed to shareholders of VAE and VAUH in connection with the companies' respective shareholder meetings expected to take place by or about early August 2012 at which approval by the companies' shareholders of the proposed transaction will be sought. As mentioned above, VAE currently holds a 29.41% interest in VAUH. In addition, four of VAE's eight directors are also members of the board and/or management of VAUH as follows: Peter Grosskopf and Norm Reynolds are directors of VAUH; Walter Coles Sr. is CEO, Chairman and a director of VAUH; and Walter Coles Jr. is the Executive VP, Corporate Development of VAUH. The proposed transaction is therefore a related party transaction under Multilateral Instrument 61-101 Protection of Minority Securityholders in Special Transactions ("MI 61-101"). The board of directors of VAE has established a special committee comprised of Bob Matthews, Ron Hochstein and Ron Netolitzky all of whom are independent (as defined in relevant securities legislation) to oversee the spin out and merger transaction. As VAE is a company listed on the TSX Venture Exchange, it is exempt from the formal valuation requirements of MI 61-101 pursuant to the exemption contained in section 5.5(b) of MI 61-101 on the basis that VAE's securities are not listed on the specified markets therein. VAE intends to seek minority shareholder approval of the proposed transaction at the aforementioned meeting for shareholders of VAE. Certain of the statements and information in this press release constitute "forward-looking statements" within the meaning of the United States Private Securities Litigation Reform Act of 1995 and "forward-looking information" within the meaning of applicable Canadian securities laws. Forward-looking information includes, but is not limited to, statements relating to the plans for completion of the Transaction, including the proposed structure, anticipated results and the approval to be sought; as well as the potential success of the foregoing. Forward looking information generally express predictions, expectations, beliefs, plans, projections, or assumptions of future events or performance, do not constitute historical fact and are subject to a variety of risks and uncertainties which could cause actual events or results to differ materially from those reflected in such statements, including, without limitation: the risk that the Transaction will not be approved by the TSX Venture Exchange, the shareholders of VAE, the shareholders of VAUH or the court; risks and uncertainties related to the Transaction not being completed in the event that the conditions precedent thereto are not satisfied, including the acceptance by the TSX Venture Exchange of an application to list the shares of VUL. Forward-looking statements contained in this release are based on the beliefs, estimates, and opinions of management on the date the statements are made. There can be no assurance that such statements will prove accurate. Actual results may differ materially from those anticipated or projected. VAE expressly disclaims any intention or obligation to update or revise any forward-looking statements and information whether as a result of new information, future events or otherwise, except as otherwise required by applicable securities legislation. The securities offered have not been registered under the U.S. Securities Act of 1933, as amended, or applicable state securities laws, and may not be offered or sold in the United States absent registration or an exemption from such registration requirements. This press release shall not constitute an offer to sell or the solicitation of an offer to buy nor shall there be any sale of the securities in any jurisdiction in which such offer, solicitation or sale would be unlawful.